Hiking is not just a great sport to keep those legs in shape for the next ski season, it is a fun adventure. 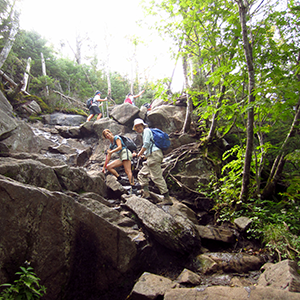 We hike year-round at various trails throughout central New York and also near our ski club lodge in central Vermont. We have even been known to hike in the Adirondacks. Everyone is usually ready for some refreshments and food after a good hike, so we then decide on a local restaurant to replenish our bodies. Check out the hiking schedule on the Club Calendar . If you want to find out what's going on at the moment, pose a question, or have an online dialog with others who are interested in hiking, you can go to the Hiking Forum.